As far as new-boat introductions go, the one held in a boat shed at The Hinckley Co.’s Portsmouth, R.I., facility Wednesday was a little unusual in that the boat was nowhere to be seen. 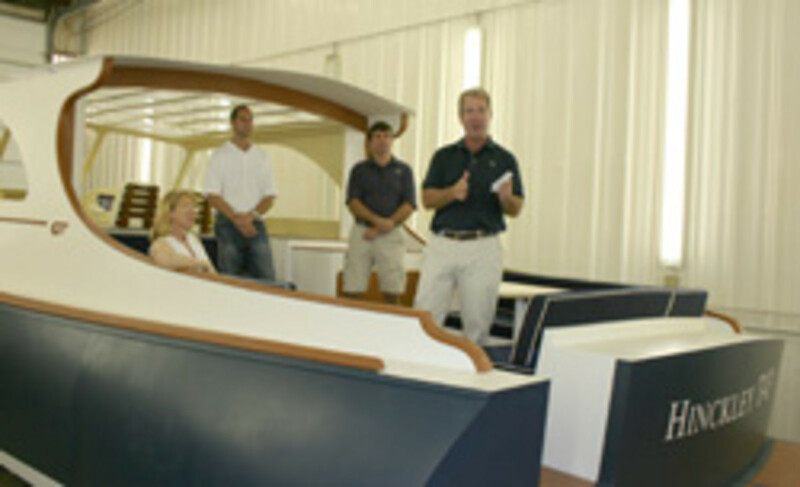 Instead, CEO Jim McManus introduced the first look at the Talaria 43 from the cockpit of a full-scale mock-up of the next model in the builder’s “second generation” of express cruisers. This generation is marked by its hull design from Michael Peters Yacht Design and a layout designed for an open-air feel. The T43 will feature the oversized, powered side windows found in the T34, T37 (the redesigned Picnic Boat) and T48. An innovative design feature in the T43: Two retractable glass windows and a glass door enable the pilothouse to be open to the cockpit or completely closed. “With the push of a couple of buttons, you have a wide-open express saloon or the warmth of an enclosed pilothouse,” McManus said. 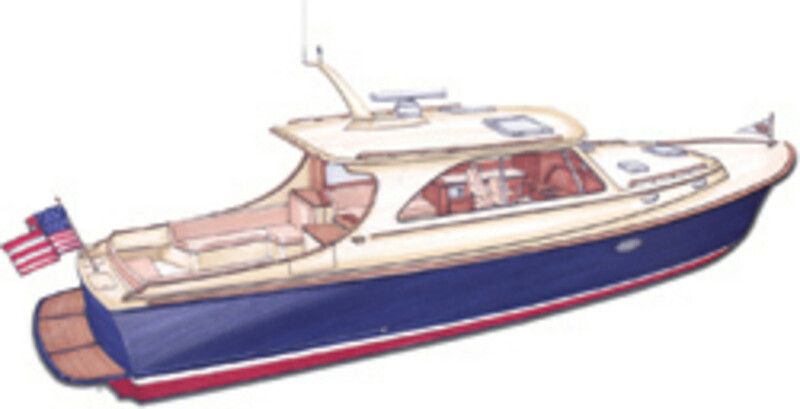 The yacht, he said, is designed around the way Hinckley’s customers want to use it. “It’s the perfect blend of outdoor space and on-board livability. That’s the nerve we’re striking with the T43,” he said. Construction has begun on hull No. 1, with customer delivery expected in late spring or early summer 2014. The starting price of the T43 is $1.575 million. McManus said the concept of a full-scale mock-up for each new design evolved from basic layouts of cardboard to assess a design’s spatial dimensions to accurate plywood representations of the boat’s design and layout, then modifying them based on customer and internal advice. What began as a design tool has evolved into a valuable sales tool. Three of the five customers who preordered the T43 walked through the mock-up, McManus said. “The full-scale mockups have become the intersection of product development and sales for us,” MacManus said.